To my surprise, unpretentious Sheffield is a quite the beer city. According to the Beer Report commissioned by the University of Sheffield, the city region has 57 active breweries. This translates to one brewery for every 23,991 people, which is 4.7 times more than London. The city is also one of the more diverse with around 400 different, unique beers available in its pubs on a typical day. Somehow left unnoticed, steel city has become beer city. Sheffield Beer Week is a fantastic initiative to promote Sheffield as a destination for beer lovers and to celebrate cask, craft beer and world beer. It aims to showcase the many local breweries and with plenty of opportunities to have a chat with the brewers themselves at Tap Takeovers and Meet the Brewer events. During the days leading up to the Beer Now Conference about marketing & tourism and the annual trade show SIBA BeerX, I had time to check out some of the beery happenings around town. The Pub Heritage Walk, as organised by the local CAMRA (Campaign for Real Ale) branch, was one of the unexpected highlights. In the safe hands of expert Dave Pickersgill, the group of beer enthusiasts visited some of the most interesting heritage pubs. For instance, we learned that Sheffield has four entries listed in Britain’s Best Real Heritage Pubs and that The Bath Hotel has won the national Pub Conservation Award. 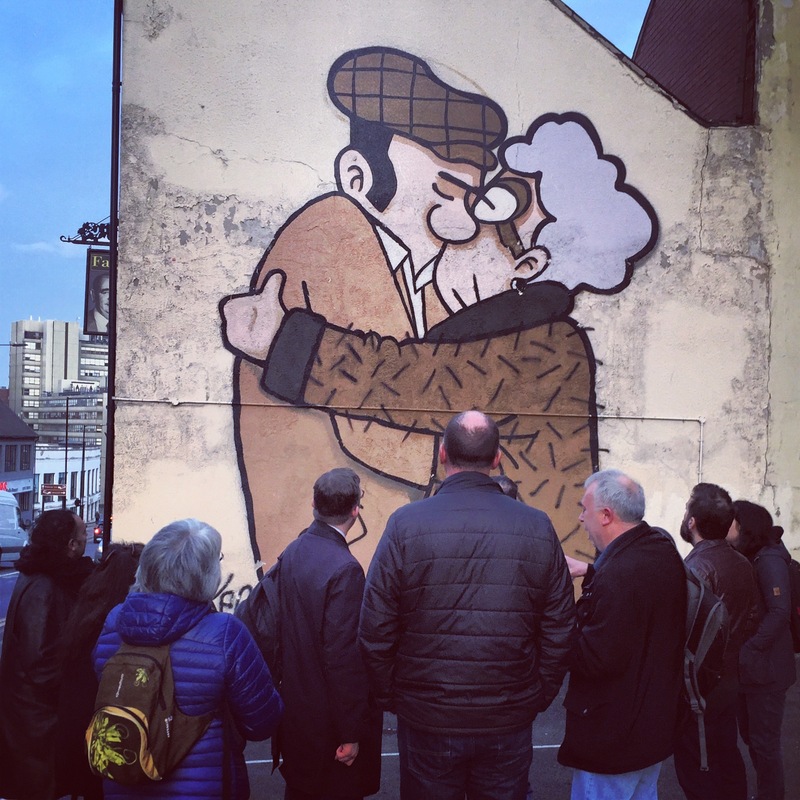 But it was not all about historic developments and influential brewers, we also saw some of the city’s creative street art scene with for example Pete McKee’s ‘The Snog’ outside pub Fagan’s, something I would surely have missed if not joining the tour. Listen to a clip from the walk here. Another great way of discovering the many watering holes whilst seeing more of what Sheffield has to offer is to follow one of the recommended Pub Trails in the city centre or further afield. And not to miss are the specialist bottle shops such as Hop Hideout, a gem run by Sheffield Beer Week’s founder Jules Gray, and Beer Central in the new Moor Market – for a chat and tips on what beers to try. In addition to unboxing this northern treasure, anyone with an interest in beer should take the chance to meet fellow enthusiasts, hear about breweries and try some local brews at similar beer events elsewhere. No doubt, beer is a superb way of finding out about a new place or even your own hometown!